This year’s 2012 Harlem River Festival will be on the land and in the water. Plans include a week of events centering on the Bronx’ own New York State Park: Roberto Clemente State Park, which has docks providing access onto the water. This is the third annual public event organized by the Harlem River Working Group (HRWG), a group of community organizations, governmental agencies and other commercial stakeholders, focused on improving environmental quality and access to and along the Harlem River — from the Randall’s Island to the Hudson River in Bronx County, New York City. Formed in 2009, we have met monthly to organize and develop goals to ensure that a green corridor is established along as much of the length of the Harlem as possible, with habitat buffer, bike and walking path greenways and river access points. From 10 am to 1 pm, Public school children will learn about riding in a canoe, important facts about the Harlem River’s history and future, and other lessons about water. On Saturday, October 20, community groups have organized the 2012 Harlem River Festival – a Party on the River and the Land. Plans include a week of events leading up to the Festival and centering on the Bronx’ own New York State Park: Roberto Clemente State Park, which has docks providing access onto the water. 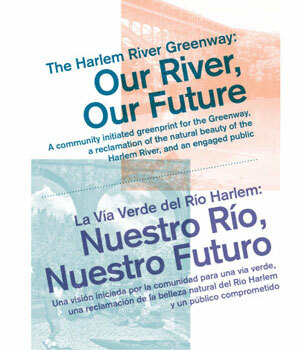 The Harlem River Greenway: Our River Our Future. A community initiated greenprint for the Greenway, a reclamation of the natural beauty of the Harlem River, and an engaged public.